1841 Living at Ipswich: Jeremiah Head (age c52), Independent. With his wife Mary Head (age c40) and their children John Head (age c9), Thomas Head (age c8), Henry Head (age c6), Jeremiah Head (age c5), George Head (age c4), Charles Head (age c3), and Mary Head (age c1). 1859 Jeremiah Head, Messrs. R. Stephenson and Co..
1863 Jeremiah Head (1835-1899) and Theodore Fox founded Fox, Head, and Co., and erected the Newport Rolling Mills, Middlesbrough, for the manufacture of iron plates. Employed 600 men, and produced 400 tons of finished iron per week, using machinery which dealt with larger masses of wrought-iron than had hitherto been worked. Jeremiah Head was born at Ipswich on 11th July 1835. After receiving his early education at home, in a private school at Ipswich, and at Tulketh Hall near Preston, at the age of sixteen he was articled in 1852 for five years in the works of Messrs. Robert Stephenson and Co., Newcastle-on-Tyne, where he served three years and a half in the pattern-making, fitting, and erecting shops, and the remaining year and a half in the drawing office. During the latter part of his time and for a year subsequently he was engaged in the designing and erection of two compound mill engines ; one of these, for Messrs. Henry Pease and Co.'s Priestgate Woollen Mills at Darlington, was fitted for the first time with a true parabolic governor in 1856, to which he subsequently added an air cataract to prevent hunting; the other engine, for Messrs. Annandale and Sons' Paper Mills at Shotley Bridge, was also fitted with a similar governor, of which there were several later examples in Messrs. R. Stephenson and Co. works. 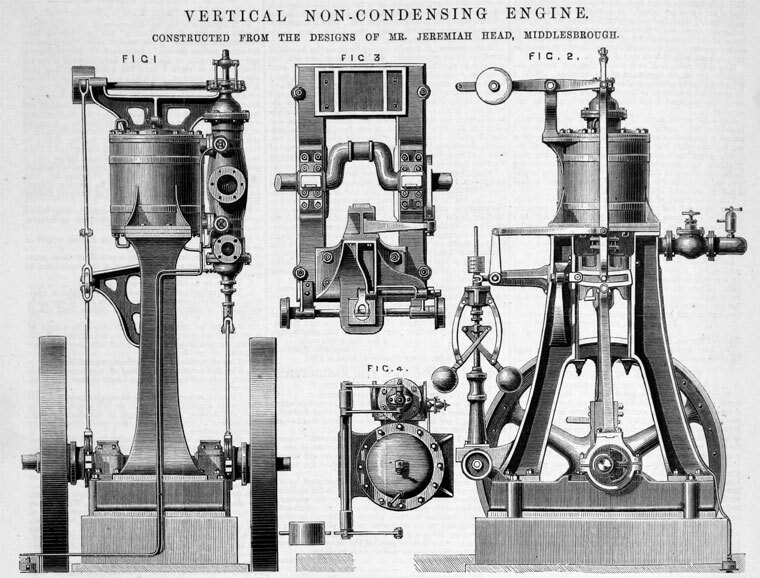 A simplified arrangement with crossed arms, forming a closely approximate parabolic governor, was subsequently devised by him for a large single-cylinder horizontal engine driving two plate-mills at the Newport Rolling Mills, Middlesbrough; and nine others were also employed at the same works. Of these governors and of their successful working he gave a description to the first Middlesbrough Meeting of the Institution (Proceedings 1871, pages 213-23), for which he acted as honorary local secretary. For two years 1857-9 he was employed under Mr. Robert Stephenson and Mr. G. H. Phipps in the reconstruction of Rowland Burden's celebrated cast-iron bridge, originally erected in 1796 over the river Wear for connecting Sunderland and Monkwearmouth; it consisted of a single arch, forming an arc of a circle of 237 feet span and 83 feet rise, with a clear height of 99 feet above low water (Proceedings 1858, page 261). The Royal Agricultural Society haying offered a prize for a steam plough, he was entrusted with the work of developing into practical form the idea conceived by Mr. John Fowler of Leeds; with the result that the prize was won at the Chester Show in 1858 by the plough made under his direction at Messrs. Stephenson's works, whence fifteen more of the same kind were afterwards turned out. Subsequently he went for a short time to Messrs. Kitson and Co., Airedale Foundry, Leeds; and then became manager of the Steam Plough Works of Messrs. John Fowler and Co. in Leeds until 1860; and besides constructing nearly a score of steam ploughs, he devised a plan of signalling by lamps to facilitate steam-ploughing at night. As agent for the firm he next spent some time at Swindon, demonstrating the practical capabilities of the steam-ploughing tackle upon farms in Wiltshire. In the spring of 1863 he joined Mr. Theodore Fox in founding the firm of Fox, Head, and Co., and erected the Newport Rolling Mills, Middlesbrough, for the manufacture of iron plates. Here they employed 600 men, and produced 400 tons of finished iron per week, using machinery which dealt with larger masses of wrought-iron than had hitherto been worked. For over twenty years he devoted himself to the details of this business, and carried into practice a plan of profit-sharing with his workmen, which was so far successful that no labour disputes arose between them even during a disturbed period. In other ways also he sought to improve the condition of the workmen; and largely owing to his initiation Middlesbrough was the first town in England to apply for the establishment of a school board after the passing of the act. Of this board he was for several years an active member. With the object of improving the industries of the district and increasing its prosperity, he originated in 1864 the Cleveland Institution of Engineers, whose interests he served for three years as honorary secretary, and afterwards for three years as President, performing daring the whole of the time much work of great benefit to the district. In 1885 the firm of Messrs. Fox, Head, and Co. was dissolved, and he devoted his time and energy to wider interests as a consulting engineer in Cleveland. In 1888 he laid out the Bowesfield Iron Co Works at Stockton-on-Tees, and in 1891 the New British Iron Works at Corngreaves near Birmingham. In January 1894 he moved his offices from Middlesbrough to Westminster, where he thenceforth practised. Several times he visited iron works in Norway; and in Spain he examined manganese mines near Santander, coal mines near Oviedo, and iron ore deposits near Bilbao and Santander. To the United States he made ten visits, bringing back thence many valuable suggestions for practical improvements in engineering industries in this country. The results of his observations he freely communicated to the leading professional societies, in papers on the iron ore deposits in Scandinavia, on American and English steel manufacture, and other subjects; his latest contribution was a paper prepared in conjunction with his son upon the Lake Superior iron ore mines, which was presented to the Institution of Civil Engineers on 14th February 1899. He acted as consulting engineer in this country for the Otis Steel Works in Ohio, and for the Alberta Irrigation in Western Canada. In 1894 he visited Salt Lake City, and reported upon a Mormon railroad; and also upon a proposed railroad from the iron works in Alabama to the Tennessee River. As an arbitrator he settled many questions between employers and workmen, including differences at Messrs. Bolckow Vaughan and Co.'s Works and at the Barrow Steel Works. In 1896 he reported for the Indian government upon the iron ore deposits at Salem in the Madras presidency, arriving at the conclusion that it would be impracticable to smelt the ores on the spot in the absence of suitable fuel and in the face of the competition of English iron delivered there. He became a Member of this Institution in 1859, and again after an interval in 1869; a Member of Council in 1874; and a Vice-President in 1880. At a season of sudden emergency, with characteristic self-forgetful readiness, he complied with the unexpected request of the Council to accept the presidency; and by the admirable manner in which he bore the anxieties and fulfilled all the duties of President during the two years 1885-6, he greatly enhanced the dignity and stability of the Institution, and won the warmest esteem of the Members. In 1893 he obligingly took upon himself as a Past-President the organization of the arrangements for the second Summer Meeting in Middlesbrough, for which he personally procured and arranged the extensive statistics furnished to the Members in the descriptions of the numerous works they then visited. On that occasion also, as well as in his two Presidential addresses, he enriched the Institution Proceedings with a store of information, interspersed with suggestions affording material for reflection. The paper he then read, on recent developments in the Cleveland iron and steel industries (Proceedings 1893, page 224), gave the best description that has yet been written of that remarkable district. He was a Member of the Institution of Civil Engineers from 1875; and of the Iron and Steel Institute from 1869, the year of its formation. In 1893 he was President of the mechanical section of the British Association at the Nottingham meeting. From 1894 he was a Member of Council of the Federated Institution of Mining Engineers. Having considerably overtaxed his strength, he went at the beginning of the present year to Bournemouth for a short rest, and afterwards to Hastings, where he appeared to be progressing favourably towards speedy re-establishment of health, when his death occurred suddenly from congestion of the brain on 10th March 1899 at the age of sixty-three. JEREMIAH HEAD, born in 1835 at Ipswich, was a son of the late Jeremiah Head, J.P., who belonged to a Quaker family well known in that neighbourhood. He received his first instruction at home, and subsequently went to a private school at Ipswich, and afterwards to the Friends School at Tulketh Hall, Lancashire. At an early age he was articled to Robert Stephenson, and served his time at the well-known locomotive and marine engineering works at Newcastle-on-Tyne, subsequently being promoted to a position on the civil engineering staff. In 1856 he was entrusted with the design and superintendence of the construction of a large pair of condensing engines, for driving the Priestgate Woollen Mills at Darlington, belonging to the firm of Henry Pease and Co. These engines were fitted with a parabolic governor, controlled by an air cataract, and comprised several other details, specially designed by Mr. Head. In the following year he designed and superintended the building and erection of another pair of engines of somewhat similar character for the paper mills of Anandale and Co, of Shotley Bridge, near Durham. A little later he was appointed resident engineer for the re-building of the iron bridge over the Wear at Sunderland, which occupied two years, and was Stephenson’s last public work of magnitude. He was then selected to co-operate with the late John Fowler in bringing to perfection the steam plough, with which that gentleman’s name is associated, and in commencing the extensive works at Leeds, which became the principal seat of its manufacture. The set of steam ploughing apparatus, which succeeded in gaining the prize of £500, offered by the Royal Agricultural Society, and was exhibited at the Chester Show in 1858, was mainly constructed at the Newcastle Works, to the designs and under the supervision of Mr. Head. He also devised and patented a system of lamp signals, whereby steam ploughing operations might be carried on at night. In the year 1863, in conjunction with Theodore Fox, J.P., Mr. Head built large ironworks at Middlesbrough, known as the Newport Rolling Mills, which he carried on until 1885. For several years an industrial partnership existed between the employers and the men at those works. Mr. Head was one of those who advocated the establishment of the School Board system at Middlesbrough, and he sat on the first board, Middlesbrough being the first town in England to apply for a School Board on the passing of the Act. In 1864 he originated the Cleveland Institution of Engineers, which has contributed greatly to the success of the iron and steel industries at Middlesbrough. He occupied the position of Honorary Secretary for three years and of President for three years. Since 1885, although still deeply interested in the Cleveland iron and steel industries, Mr. Head devoted his time and energies almost exclusively to consulting engineering. He designed and supervised the carrying out of several iron and steel works plants ; made numerous investigations, sometimes under an order of court, sometimes at the instance of private owners, as to properties in litigation, or otherwise in difficulties. Of late years he paid frequent visits to the United States, where he had much professional work. He made exhaustive reports on various properties, more especially iron, coal and manganese mines, and iron and steel works, for English and foreign clients. He was frequently retained as technical expert in law and arbitration cases connected with mechanical engineering and metallurgy, and still more often as sole arbitrator. He was frequently agreed to on both sides as referee on wages questions between large employers and their workmen, and he always succeeded in arriving at decisions which secured the respect of both parties. As a valuer of technical and other properties, Mr. Head had large experience, the aggregate amount which passed through his hands in this way reaching several millions during the last few years. Mr. Head contributed several Papers to the British Association, the Federated Institution of Mining Engineers, the Institution of Mechanical Engineers, the Iron and Steel Institute, the Cleveland Institution of Engineers, the Sheffield Technical School, and various other societies, as well as numerous articles to the current technical literature of the day. Among his more recent contributions may be mentioned: 'English and American Methods of Manufacturing Steel Plates,' before this Institution in May 1896, for which he was awarded a Watt Medal and a Telford Premium; his joint Paper with his son, Mr. A. P. Head, on 'Lake Superior Iron Ore Mines,' before the same body in February, 1899 ; 'Cleveland Industries' before the Institution of Mechanical Engineers in August 1893 ; and 'Mechanical Science as exemplified in Nature,' being a presidential address before the British Association, Section G, September 1893. In 1885, having long been a member of Council, he was elected to the Presidential Office of the Institution of Mechanical Engineers, and held that position for two years. In 1894 at the Nottingham Meeting, he presided over Section G, Mechanical Science, of the British Association for the Advancement of Science. He was one of the original members of the Iron and Steel Institute, the Treasurer and a member of the Board of Management of the British Iron Trades Association, and a member of the Board of Conciliation and Arbitration of the North of England Manufactured Iron Trades. He was a member of Council of the Federated Institution of Mining Engineers. Since January, 1894, Mr. Head had been practising in Victoria Street, Westminster, in partnership with his son, A. P. Head. Mr. Head died at Hastings on the 10th March, 1899, in his sixty-fourth year. His career was distinguished by great energy and untiring zeal, and he acquired valuable knowledge and extensive experience of mechanical engineering and metallurgical practice. The industrial partnership above referred to greatly assisted to introduce the system of co-operation into the Middlesbrough district, and the iron industry of Cleveland owes much to his example and influence. Mr. Head was elected a Member of this Institution on the 2nd March, 1875. JEREMIAH HEAD died at St. Leonards on March 10, 1899. Born in 1835, he was educated at the well-known school of the Society of Friends at Tulketh Hall in Lancashire. In 1851 he was articled to the late Robert Stephenson of Newcastle-upon-Tyne, who selected him in 1857 as resident engineer in the construction of the iron bridge over the Wear at Sunderland. His attention was subsequently devoted to improving the steam-plough with conspicuous success. In 1863, in conjunction with Mr. Theodore Fox and others, he established the Newport Rolling-Mills at Middlesbrough, and from 1867 to 1874 these works were carried on on the industrial co-partnership principle. In 1885 the works were stopped, and since that date Mr. Head followed the profession of a consulting engineer. He was the originator, in 1865, of the Cleveland Institution of Engineers, of which he acted as secretary until 1871, when he became president. In 1885 he was president of the Institution of Mechanical Engineers, and in 1893 was president of the Mechanical Science Section of the British Association. He was also one of the most prominent members of the Board of Conciliation and Arbitration for the Manufactured Iron Trade of the North of England, and acted as one of the treasurers up to the time of his death. As a man of science and as an inventor he accomplished much. He undoubtedly made his influence felt, both industrially and socially, especially at Middlesbrough, where the Cleveland manufactured iron trade, of which he was one of the pioneers, owes him more than can easily be estimated. He has enriched technical literature with a large number of contributions of permanent value. His last paper was communicated to the Institution of Civil Engineers very shortly before his death. It dealt with the Lake Superior iron ore region and its influence on the production of iron and steel, a question which he, in conjunction with his son and partner, Mr. A. P. Head, had specially investigated on the spot. He was one of the original members of the Iron and Steel Institute, and was a regular attendant at its meetings, He contributed to the Proceedings papers in 1871 on the efficiency of plain cylindrical boilers; in 1872 on the Newport puddling furnace; in 1873 on a new method of preventing shock in reversing rolling-mills ; another in 1873 on the recent boiler explosion at the Linthorpe Ironworks; in 1894 on Scandinavia as a source of iron ore supply; in 1896 on the manganese ore deposits of Northern Spain, and in 1897 on charging open-hearth furnaces by machinery. This page was last edited on 15 January 2019, at 12:18.